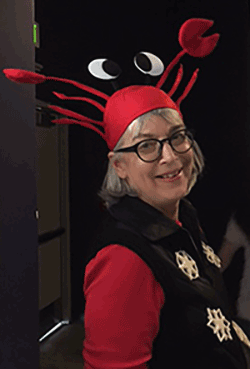 With an extensive background in a wide range of environmental, scientific and marine policy issues, Penny has served as Washington Sea Grant’s director since 2005. In this capacity, she has overseen the organization’s expansion into new research and outreach areas including social science and ocean acidification. She also directed a six-year geoduck aquaculture research project under the direction of the Washington state legislature. Prior to her appointment at Washington Sea Grant, Penny was vice president of the Consortium for Oceanographic Research and Education, where she was involved in efforts to strengthen ocean science and policy, including support for national and international initiatives like the U.S. Ocean Commission. From 1999 to 2001, she oversaw nationwide management of living marine resources as assistant administrator for fisheries at NOAA and head of the National Marine Fisheries Service. Judging at Orca Bowl, 2015. Penny was a staff member on the U.S. Senate Committee on Commerce, Science, and Transportation for 13 years and directed the Democratic staff of the Oceans and Fisheries subcommittee and the Science, Technology, and Space subcommittee. She has been deeply involved in the enactment and reauthorization of numerous science and ocean laws, including the Sustainable Fisheries Act, the Global Change Research Act, the Marine Mammal Protection Act and the Oceans Act of 2000. She holds a bachelor’s degree in Biology from Dickinson College and a master’s in Marine-Estuarine-Environmental science from the University of Maryland.